Love is finding the energy to help others. On this Valentines Day, many across Haiti are blocked in their homes and isolated in small towns as protestors continue "Operation Lock" which is effectively blocking transit and commerce throughout the country. There is growing tension as fuel, food, and clean water supplies run low. Protestors have reason to feel exasperated. Inflation has surged, making basic staples - many of which are imported - unaffordable for much of the population. Fuel shortages, and a growing outrage around development funds missing from the government coffers are driving louder and louder calls for the president's resignation. Love takes many forms. Sometimes it demands protest. Sometimes it requires patience. 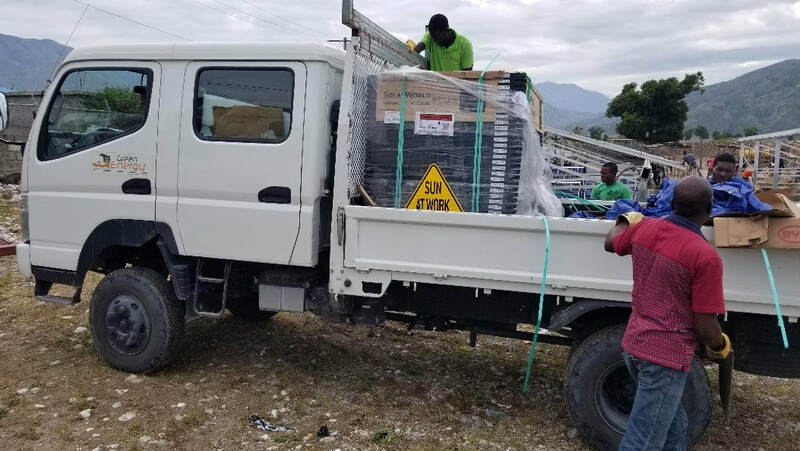 Though some are facing challenging circumstances in Port-au-Prince, most of the EarthSpark and Enèji Pwòp team members are safe (though stuck) in Les Anglais where the solar-powered microgrid is steadily providing energy to the town, undeterred by the national crisis. We're happy today to share a new team photo of our growing team as well as a reflection from an independent consultant who recently came to assess our work. In the face of challenges and uncertainty, Love persists. If Love is finding the energy to help others, we will continue building it. Happy Valentines Day from the EarthSpark team. By Ash Sharma. Published Feb 1, 2019 on LinkedIn here. The much vaunted phrase “win-win” doesn’t begin to capture the Haitian rural electrification project I have recently been evaluating. The Earth Spark mini-grid project implemented through local affiliate Enèji Pwòp (Clean Energy in the Haitian Creole language) combines energy access with energy transition, promotes the concept of Feminist Electrification http://www.earthsparkinternational.org/blog/feminist-electrification, builds rural livelihoods and addresses energy poverty reduction. You can add to the mix a dash of avoided deforestation, reduction of indoor air pollution and an increase food security through the electrification of on-site post-harvest processing. The natural beauty of Haiti and the warmth of its people masks an underlying lack of economic opportunity, a worsening environment (evidenced by lack of waste and sanitation provision in the southern peninsula), poorly developed transport infrastructure, climatic vulnerability and the ever present risk of weather related disaster. It is against this backdrop, that Enèji Pwòp has implemented an UNFCCC award winning solar minigrid system. I visited two towns where solar arrays had been deployed, met local consumers, institutions and microbusinesses, and witnessed at first hand the development of local enterprise and realisation of potential. Through retailing small, clean energy products and developing micro-grids, the social enterprise has mainstreamed gender considerations into its business practice. In Les Anglais, it has prioritized reaching out to women for training as clean energy and micro-grid entrepreneurs, as customers, and employees, with women as promoters of the grid (“ambassadors”) who play a key role in reaching out to other women and energy vendors. Haiti’s critically low level of access to electricity (around 10% of rural areas) seriously hampers growth and poverty reduction endeavours. By aiming to build an additional 20 mini-grids in off-grid communities in 3 years, Enèji Pwòp expects to directly serve approximately 35,000 additional people through approximately 6000 new grid connections. The project is learning by doing in a difficult environment successfully experimenting with smart meters, cloud based customer management and billing systems, and innovative cost reduction strategies. Truly impressive work from a talented and committed team. Enèji Pwop Les Anglais, Enèji Pwòp Tiburon, and EarthSpark teams meeting for the first time in Les Anglais last month. While our projects expand so must the EarthSpark family. A couple of weeks ago Enèji Pwòp’s Les Anglais team and brand new Tiburon team met with two-thirds of the EarthSpark team to kick off 2019 with soaring spirits. Despite the unrest gridlocking the country, we are grateful to work together and share our love for the communities we work with. Making 2019 a Lighthouse year! Wendy and Allison receiving EarthSpark's Momentum for Change Award for 'Feminist Electrification' at COP24 in Poland, Dec 2018. A happy new year to you all! 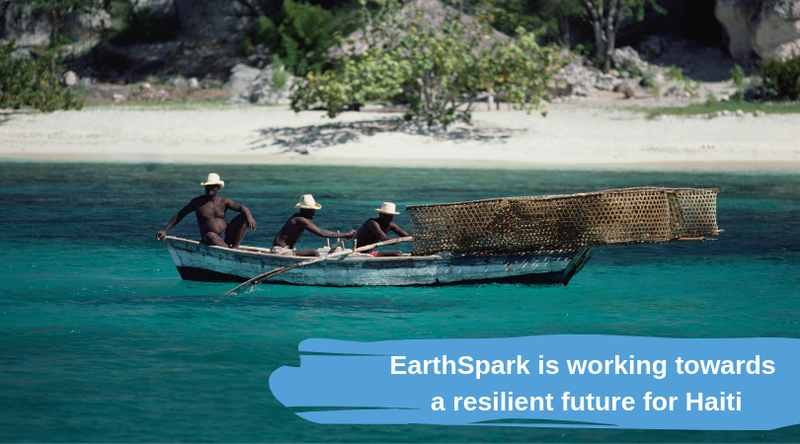 We’re thrilled to start our year with an exciting headline: EarthSpark won a UN Climate Change award! Last month, we were honored to receive a 'Lighthouse Award for Climate Action' at the COP24 Climate Summit in Poland. The awards ceremony — where Wendy and Allison received the award for EarthSpark’s “Feminist Electrification” — was billed as ‘one of the most inspiring and hopeful moments of the COP.’ The Secretary General of the UNFCCC opened our event and praised the 15 winners for ‘real world examples of what scalable climate action looks like’. To have our work recognized by the United Nations is a BIG deal for us, and we want to thank everyone who has helped us along the way. This award is for you! The climate conference concluded with hard-won progress in the world of international treaties. This is great, important news and also totally insufficient. Being at the conference reminded us that all actors – individuals, businesses, organizations, and governments – need to push for progress on solving climate change. When we do, we enable others to also make progress. One theme that was very strong in Poland was “Just Transition”, the notion that the best climate solutions build not only a cleaner economy but a more fair and inclusive world. From coal miners to communities that have never before had electricity, a Just Transition means that prosperity is possible as we collectively transition away from fossil fuels. One other note from the conference: Unlike some who were claiming that fossil fuels are necessary to solve energy poverty, EarthSpark was there to share our evidence to the contrary. The first year of EarthSpark’s Les Anglais microgrid was over 98% powered by solar energy, directly from the solar panels and from the solar energy stored in the system’s batteries. The remaining ~1.5% of the power was provided by our backup diesel generator, but we are working towards phasing out fossil fuels entirely since the full costs of logistics and management are quite high compared to solar and other efficiencies we can achieve through smart metering and user participation. 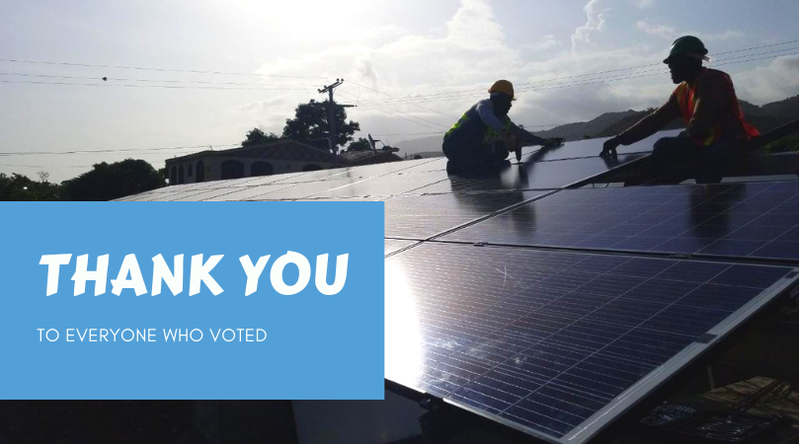 While the recognition in Poland felt fantastic, we’re excited to be back to work building more grids to deliver more energy and opportunity in Haiti. We’re looking forward to making great strides in 2019, and we are ever-grateful that you are sharing this journey with us. Image: Les Anglais business woman, Madame Delene, cooking her famous fare over charcoal. ​As we welcome the holiday season, food will be central to many celebrations. Although the occasions may differ culturally, food feeds family holidays everywhere. In Haiti, aromas of spiced meats and vegetables, fried plantain, rice and sauce rise into the air and dance around neighborhoods, calling friends and families to their homes to eat and drink and revel in each other’s company. The flavors and recipes of Haitian cuisine have evolved over years of charcoal-fueled cooking. Come New Year’s Day, nearly every home will slowly stew the famed ‘soup joumou’ over hot coals. According to local lore, the rich pumpkin soup was formerly reserved for plantation owners. Fittingly, the now widespread enjoyment of soup joumou on January 1st has become a symbol of Haiti’s independence. Thanksgiving, Hanukkah, Christmas, Kwanza and various New Year celebrations are right around the corner. What role will food play in your festivities? Where will you source your food and how will you cook it? There is no doubt Haiti’s cooking is a conduit to its culture. Haiti's cuisine is nourishing and flavorful, and it brings family together. However the reliance on charcoal for cooking, a consequence of energy poverty, also risks household health, releases black carbon, contributes to deforestation, and exacerbates Haiti’s vulnerability to natural disasters. Working with members of the Les Anglais and Tiburon communities, EarthSpark is exploring the electrification of cooking in these microgrid contexts. It is a seemingly small solution to a big problem, but there is potential to eliminate the health and climate damage of day-to-day charcoal cooking by enabling grid-connected households to use clean microgrid electricity with electric cooking appliances. Of course, we are all anxious to see how the soup joumou and other favorite recipes will taste! As with other EarthSpark efforts, the electrification of cooking in the microgrid context is not just a potentially new approach to energy poverty in Haiti but is also relevant to the way people think about energy access and infrastructure design around the world. To everyone preparing a celebratory meal this holiday season, happy cooking and bon appétit! This article is an update of our original 2015 blog by the same name. 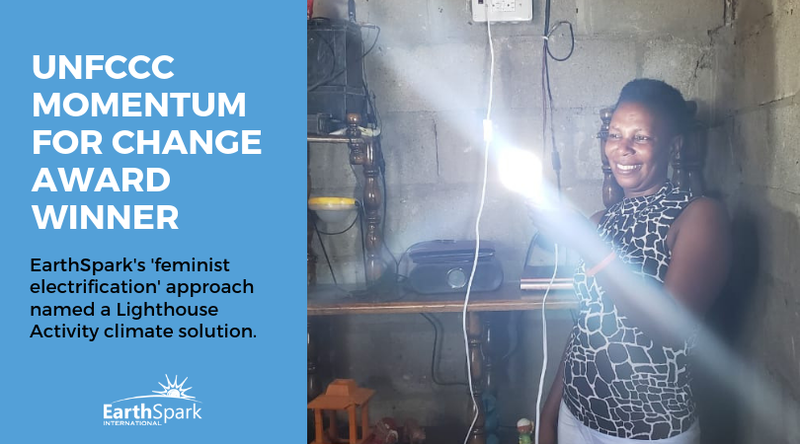 ​​EarthSpark International is pleased to announce that our commitment to Feminist Electrification was awarded the Momentum for Change Lighthouse Activity Award by the United Nations Framework Convention on Climate Change! Wendy and Allison from the EarthSpark team were at the UN Climate Conference in December receiving the award and working to promote how climate justice and gender justice are inextricably linked. Electrification is the process of powering by electricity and is usually associated with changing over from another power source. The broad meaning of the term, such as in the history of technology and economic history, usually applies to a region or national economy. The arrival of electricity service in a town signals a significant moment of technical, social, and economic change. Residents put away their candles and kerosene lamps and – for the first time - flip switches for electric lighting. People charge phones in their own homes and launch businesses to charge phones of people living beyond the new grid. Small appliances like radios and DVD players which had previously been impossible or cumbersome to operate – requiring a battery to be charged and transported or the repeated purchase of non-rechargeable batteries – become more commonplace, and, depending on the level of electricity service available, new opportunities in home appliances, refrigeration, and mechanized labor may emerge. The economic benefits of electricity have been well documented, but there has been relatively little attention paid to the gender outcomes of the arrival of electricity in a town. How can community leaders, non-governmental organizations, and grid developers leverage the social disruption that is electrification to improve the standing of women and girls in the community or, at a minimum, at least ensure that the standing of women and girls is not diminished? Energia, an international organization specifically promoting women’s empowerment through the issues of energy, points out that globally women are largely absent from energy-related infrastructure decisions. This is in spite of research that indicates that involving women in the planning and implementation phases of infrastructure development improves outcomes not only for women and girls but also for men and boys and for the funders (and overall sustainability of the project) too! Women’s participation increases the effectiveness, quality and sustainability of infrastructure rehabilitation and maintenance; provides a high economic rate of return (31 percent); and creates an improved work environment, with less violence and drinking in project sites. 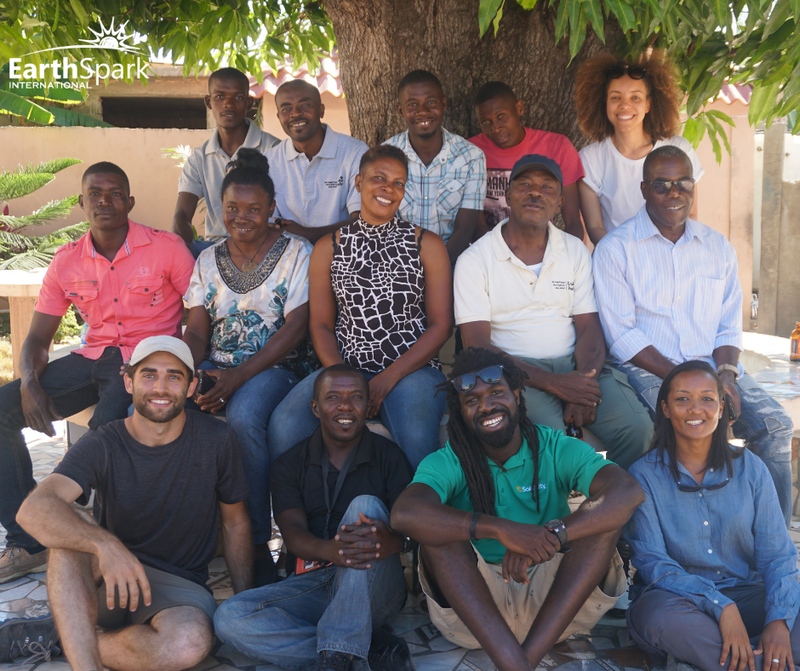 In the rural Haitian towns where EarthSpark is active, both men and women take leadership roles in local organizations and economic activities, but gender norms rest – as they do in all cultures – on a complex set of cultural patterns and local circumstances. Women tend to manage household finances related to agricultural production and local trade. There remains, however, a trend towards male dominance in decision-making at the high levels of local governance. The areas of opportunity for gender-related engagement in the electrification process fall into at least five categories: infrastructure planning, training and employment, small and medium-sized enterprise (SME) promotion, domestic energy use, and community resource availability. A Haitian proverb often heard in Haiti says that fanm se poto mitan ("women are the pillars of society"). EarthSpark is working hard to ensure that these pillars of society are both beneficiaries and agents of change in their community helping to bring light and hope to all. In general, access to electricity improves people’s lives by improving health, education, and economic outcomes. At the same time, local women are often under-represented in the decision-making process leading up to and structuring electrification. Since electrification of a town is by definition a cultural disruption, there is an opportunity to thoughtfully design the process to ensure “pro-women” outcomes. Not only is serving women’s needs an important tool in reducing extreme poverty; it also improves the viability of rural electrification business models. It is thus imminently within EarthSpark International’s mission to use a 'feminist electrification' lens in grid development planning and operations. From community engagement to employee recruitment and training to women-owned SME support and beyond, the women and men of EarthSpark and our partner organizations are hard at work on both climate and gender justice. Involving women in decision-making is increasingly associated with better ROI for funders. EarthSpark’s ‘Feminist Electrification’ integrates this concept across its business model in a trailblazing way. Board rooms across the world, take note!" No matter what the field, diverse perspectives yield better results. EarthSpark’s ‘Feminist Electrification’, which makes sure women are represented and involved at all levels of energy system planning and operations, is filling a critical need!" Please join us in the global conversation for a climate resilient future by sharing this story. A version of this blog post first appeared in EarthSpark's newsletter. If you would like to receive EarthSpark news directly, please join our mailing list! The bad news: We are already feeling the effects of climate damage. At the rate of current emissions, we are on track to blow through our ‘carbon budget’ in as few as 12 years. Keeping climate change within the bounds of what many perceive as the maximum 'safe' limit would require "rapid, far-reaching and unprecedented changes in all aspects of society," the IPCC wrote. They continued, "With clear benefits to people and natural ecosystems, limiting global warming...could go hand in hand with ensuring a more sustainable and equitable society." Ending poverty and solving climate change are largely the same work. Our urgent problems are also our unprecedented opportunities. Working with communities in rural Haiti to envision and build transformative clean energy infrastructure from scratch, we feel the joy and the hard work of conditional optimism every single day. You are part of this journey with us, and we couldn’t be more grateful. 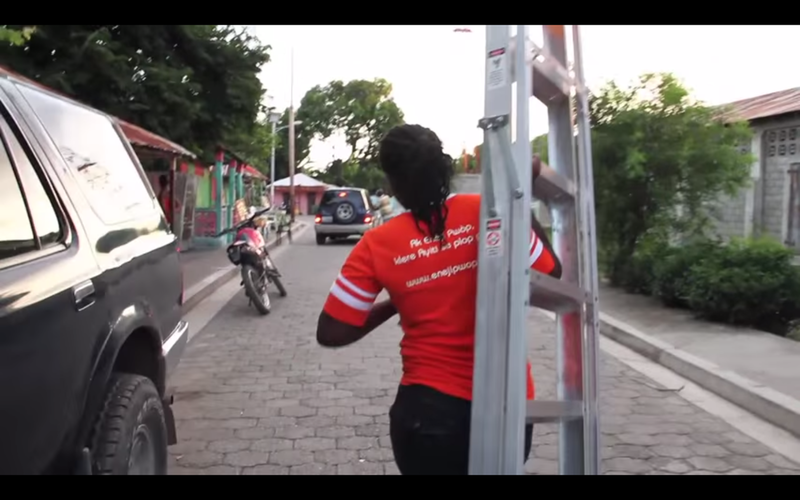 Please donate $25 now to help us build our next grids in Haiti. One final note on optimism and action: as the US mid-term elections approach, we encourage those in the US to get involved and ask candidates about climate change leadership. Policy and prosperity are closely linked, and governments’ failure to build effective climate policies risks counter-balancing a lot of progress. In actions and advocacy, now more than ever, we each have a powerful role to play in shaping our collective future. Ready to build some treehouses? Earlier this month during Climate Week in New York City, Executive Secretary of the UNFCCC, Patricia Espinosa, named EarthSpark International a winner of the United Nations Momentum for Change Climate Action Award for our 'feminist electrification' approach to microgrid development. 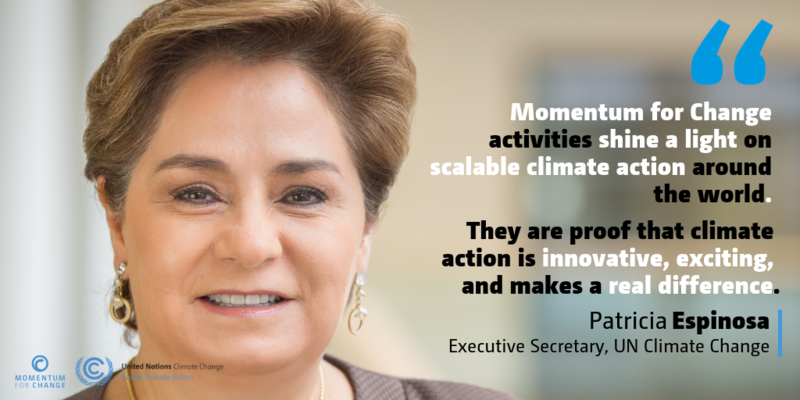 Fifteen projects were chosen from a pool of over 560 applications from all over the world ranging from businesses and governments to communities and organizations.“These activities shine a light on scalable climate action around the world,” said Patricia Espinosa, Executive Secretary of UN Climate Change. “They are proof that climate action isn’t only possible, it’s innovative, it’s exciting and it makes a difference.” This week a film crew from the UN came to Les Anglais to cover the story. We can't wait to share their footage with you! Thank you to the 240 individuals who took the time to cast their vote for EarthSpark for the MIT Solve's popular vote award. We came in a solid second place, beaten out by a wonderful team working to restore shoreline habitats. Once again, we are honored to be surrounded by an entire community working on thoughtful, innovative solutions to resilient communities, climate change, and poverty. Thank you for your continuing support in making our work a reality. As you may be aware, parts of Haiti were hit with fatal earthquakes over the weekend. While Haiti's southern peninsula was lucky to escape unscathed, other regions weren't so lucky. We offer our thoughts and hopes for a better future to those who've suffered loss. The devastating impact of natural disasters and extreme weather events are exacerbated by poor infrastructure. As more storms and more quakes are inevitable, we take solace in working with communities to help build resilience as we build power. Allison is a is a member of the 2018 GSBI In-Residence accelerator cohort at Miller Center for Social Entrepreneurship at Santa Clara University. This blog post originally appeared in the GSBI August Newsletter. Watch Allison's presentation to the Miller Center community in Santa Clara here. The solar array for EarthSpark's newest microgrid in Tiburon, Haiti is about to be commissioned. ​By the end of the recent GSBI in-residence program, I was feeling energized, appreciative, and – on one question – flummoxed. It was a fleeting, rhetorical question: Was my focus solving poverty or solving climate change? I’m a new apostle of simplified messaging, but on this point, ‘both’ still seems the right answer. As images of protests in Port-au-Prince hit the papers in recent days, we haven't seen much discussion about the underlying reliance on fossil fuels, the way fossil fuel subsidies impact rural households, and just how much people are already paying for low-quality, combustion-based energy. For context, many low-income households in Haiti are already spending 6-10% of their budgets on kerosene and candles for lighting. Increasing kerosene prices by 51%, as was proposed, would have a very real impact on rural households many of which are already struggling in a difficult economy. The issues of fossil fuel subsidies and how they impact the poor are complex, but one way to mitigate the impact of reduced fuel subsidies would be to increase clean energy use in Haiti. In our experience, solar-powered electricity systems can deliver less-expensive, higher-quality energy services to homes and businesses in rural Haiti than can diesel, kerosene and candles - with or without the fuel subsidies. In fact, most homes connected to the Les Anglais microgrid are saving 80% of their household energy budget for lighting compared to what they were spending on kerosene and candles before the grid arrived. Thank you to those who have reached out to us over the past few days. Our team is safe and working hard to expand clean energy access in the countryside. The World Cup final is upon us! This year Haiti may be watching from the sidelines but the fanaticism over the past few weeks has been palpable as Brazilian and Argentinian flags draped from rooftops and motorcycles, and a chorus of cheers echoed through town as heroes of ‘futbòl’ scored another goal. As an energy provider in Haiti, we understand how the provision of electricity for these important games is makes for satisfied customers and contributes to the quality of life of the community at large. While working to repair and reconnect customers to the Les Anglais network over the past year, the town was remarkably patient and understanding of the time it takes to rebuild. There was however, a common anxiety. Time and time again we were asked if there would be electricity in time for the World Cup. Taking into account the customer demand and coincidental timeline restrictions, we agreed the start of the World Cup would make for a jovial priority milestone for having all customers reconnected. The good news is… we kicked that goal! All Les Anglais customers that were ready (i.e. customer houses physically ready for connection and contracts signed) were reconnected and electricity was flowing by the start of the World Cup on June 14th. This meant across 330 connections, crowds huddled around radios and televisions for each of thrilling game. EarthSpark is not the only utility that understands events like the World Cup highlight the impact of electricity on a community. Those tuning into the national sports channel saw EdH (Electricity of Haiti) sponsored commercials at halftime. This world event is a rare opportunity for the national electric utility to make the case that paid bills lead to better service, among several key messages. Not unlike us, many government-sponsored energy projects in the north and south appeared to tailor project deadlines to correspond with the beginning of the World Cup. Though recent rebuilding efforts in Les Anglais have been swift, potentially due in part to this once-every-four-years sporting event, it’s only part of the story. The rebuilding efforts span over many months of hard work as far back the first few weeks after Hurricane Matthew in 2016. Our most recent challenge in the rebuild was to return our generation system to full output. Previously, with fewer customers, the damaged system’s solar capacity was sufficient to meet lower demands. As we continue to connect more and more customers, the need to achieve full output is unquestionable. We partnered with the government and a local solar company to fully restore the solar array. The shiny modules were commissioned days before the beginning of the World Cup. As the town celebrates the ups and downs of sports and we near the end of our rebuild, we are reminded of the ever-present need for energy access. Lighting, cooling, mills, pumps, televisions and radio all provide services that are life improving on a daily basis. As the flags get packed away and the cheers fade into memories, we will continue to provide the tools necessary for the community to tune into the games but also for working and growing in Les Anglais. 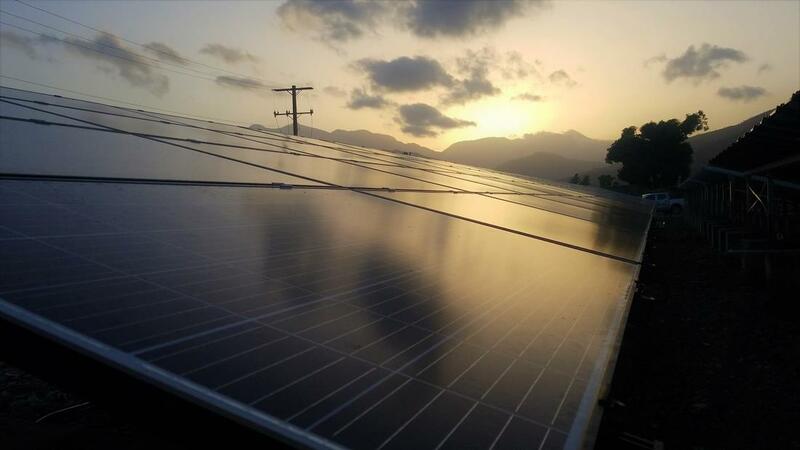 "Sun at Work" as the PV generation is rebuilt. A very common sight across Les Anglais during the World Cup. The sun rising on our newly rebuild PV arrays. lights on in les anglais! Les Anglais residents registering for Enèji Pwòp electricity service. With lights gradually coming back on across Les Anglais, ground broken for the new microgrid in the neighboring town of Tiburon, and fundraising for future grids underway, we hope our readers can understand how it’s taken us until May to write our first blog post of 2018. We’re excited to share with you our progress over these last several months. In the slow but steady recovery from Hurricane Matthew, 50 homes and businesses have now been reconnected to the repaired electricity grid in Les Anglais. A team of local electricians are hard at work installing home wiring for the next batch of customers to be re-connected. Residents are eager to re-register for service, and vendors are back in business selling plop plop (energy credits) to those customers with grid connections. In coordination with the Haitian government, we are planning with a local engineering firm to replace damaged racking and solar panels on the PV generation site which will further expand the available electricity output of the system. “The long wait for repairs has been difficult for everyone. One silver lining was that we were able to incorporate lessons learned into design improvements for the grid. It is now extremely gratifying to be reconnecting customers,” says Adam Eberwein, microgrid operations manager in Les Anglais. As our electricians reconnect each subnetwork to the grid, we’re careful to consider the impact of the customer load on the battery and inverter system after 18 months of minimal load. A rebuild plan is underway to build back stronger. From solar panels to re-installed home wiring, no single aspect of the microgrid re-launch is complete yet, but – at last – we are finally switching service back on and feeling great momentum. A fishing village located approximately 45 minutes west of Les Anglais, Tiburon has become the second town to partner with EarthSpark for energy access. After an exhaustive RFP process that attracted 25 bids, we’re proud to have contracted Haitian engineering firm DigitalKap to build the Tiburon solar hybrid generation site. DigitalKap broke ground in Tiburon in January. Racking is now complete, and the installation of solar panels is expected to begin next week. Several open issues stand in the way of the new generation system actually powering the homes and businesses of Tiburon. At the time of this writing, the government of Haiti has committed to repairing the town’s distribution network which was damaged by Hurricane Matthew. The legal and regulatory process for microgrids in Haiti is also in flux in a way that jeopardizes EarthSpark’s ability to connect the generation site to the customers. Haiti’s rural south is scattered with rural municipalities, towns, and villages of all sizes. We look forward to a future where reliable electricity is a reality in each community. To start serving towns smaller than Les Anglais and Tiburon, we are in discussions with two small communities near Les Anglais. We have begun fundraising for 2 “starter grids”; small modular grids that can power approximately 50 homes each and can be easily expanded to serve more customers and higher levels of demand once established. From stand-alone solar lanterns and solar home systems for extremely remote households, to ‘large’ microgrids, many shapes and sizes of clean energy solutions can solve energy poverty. Developing a portfolio of these different solutions continues to be central to EarthSpark’s commitment to “proving what is possible” for energy access in Haiti. Beyond the Les Anglais and Tiburon grids and two ‘starter grids’, we are working towards four additional microgrids that can deliver affordable, reliable, clean electricity to an additional 4 communities within a year. 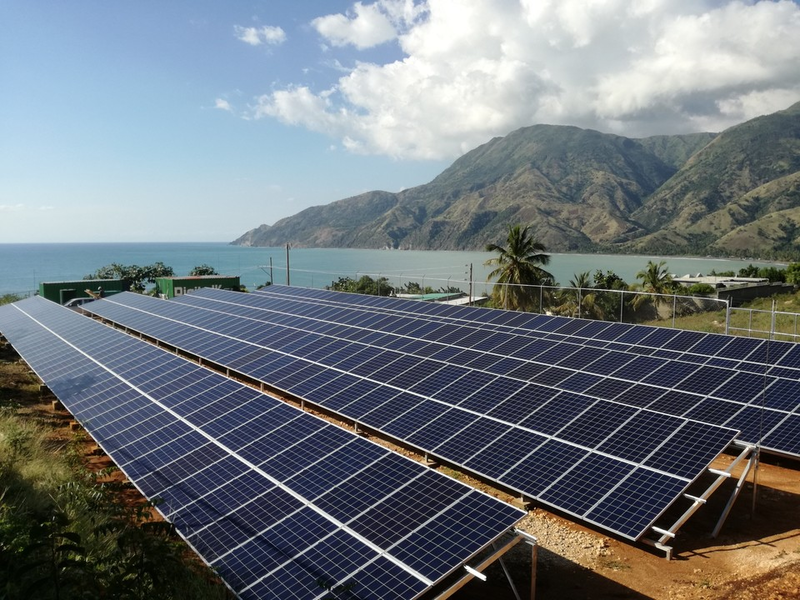 In order to mainstream microgrids in Haiti, it is critical to continue pushing through the processes, clarifying the policies, and building the track record that can become investable for the next 20 grids. At times, finding the stepping stones to our ultimate goal of enabling 80 microgrids in Haiti feels like a leap into the dark, but as the light returns to homes in Les Anglais we're reminded that progress is possible. Racking is nearly ready for the solar panels at the scenic Tiburon generation site. Testing streetlight designs to be installed across Les Anglais. Local entrepreneurs' freezers are chilling drinks in the inverter container at the solar generation site. If you walk through Les Anglais today, the greenery is a little more scarce than usual, there are wrecks and ruins between newly rooved homes, and the market is yet to be replenished with its usual wealth of fruits. Hurricane Matthew’s signature remains graffitied across town. And if you’ve ever walked into La Place (town square), chances are you’ve seen Vlad and his store. Raised in Port-au-Prince, Vladimir, or Vlad as he’s affectionately known, moved to Les Anglais before he finally had the chance to use his certification in technique de refrigeration (refrigeration technique). Saving money from relatives abroad, Vlad finally opened Saint Jacques Shop in 2014. His enterprising mind saw a local need for moto parts, not only saving people a trip into neighboring communes, but also drawing people into Les Anglais. It has since grown to sell food, cosmetics, and other mixed items. Once Enèji Pwòp electrified Les Anglais homes and businesses, Vlad saw the opportunity to grow again. This time he bought a freezer to sell icy cold drinks. Like so many others, Matthew shattered Vlad’s livelihood. With his roof gone, he lost approximately 75,000 gourdes (approx. $1170) in new inventory, and his family lay home in tatters. Eager to rebuild, Vlad eventually used a small, gasoline generator to run his freezer again. Running for about 16 hours per load, his drinks were never quite cold enough, and the generator, proved costly to fuel. Others resorted to transporting ice from Les Cayes (3 hours away), or running freezers on propane or diesel generators. As one of the few shops to still offer cool drinks, clientele demand increased faster than he could supply. In May of 2017, Vlad proposed an opportunity with EarthSpark. Our generation system was live, but was waiting for the town to recover before rebuilding our distribution system was possible. Within days of approaching us, Vlad and 2 other local entrepreneurs, became EarthSpark’s first customers since the Hurricane, with their freezers running from our generation site. Vlad’s drinks are icy cold again, his energy bills 40% cheaper, and due to the sheer volume of sales, he’s reduced drink prices. As EarthSpark continues to rebuild, we remember the scale of change and possibility an electrified town brings. Over the coming weeks technicians and engineers will arrive, and the enthusiasm in Les Anglais is palpable. Stories like Vlad’s are a reminder that while lights aren’t back on (yet), Les Anglais is not closed for business! Vlad's shop has a new roof and awaits it's electricity connection.